It finally arrived! I walked into Good Games Melbourne during lunchtime on Tuesday. Looking around and lo and behold - a bunch of large brown boxes labelled Fantasy Flight Games. The first had something about Star Wars minis, so I threw it aside. 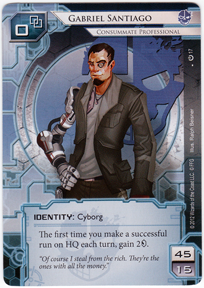 But there underneath was what I have been waiting for all these weeks, "Android: Netrunner" in bold print. From there it was easy. I grabbed the guy from behind the counter and forced him to open the boxes. I then waited patiently whilst he called his boss for a retail price. $55 later, and the box was mine. I think I was probably the first person in Melbourne to own a box. Getting back to the office I assembled a couple of the basic decks (Shaper vs Weyland) and played for 10 minutes with a coworker. I taught him as we played, which I found extremely easy to do. This game just flows naturally, and I just love the way that the cards in front of you become servers you are protecting. The theme is deeply entwined with the mechanics. And the art it right up my alley. Guess I'd better list the things I don't like, which are all minor. These cards are very thin. I was nervous touching them without sleeves as they seem easy to scuff or bend. Sleeves are a must! Some of the corners were not cut as smoothly as I would have expected. I don't really like all the different counters they provide. Would have preferred one simple token that can then be used for all requirements. Personal taste! Since then I've built myself a couple of decks and played a few games. Both decks are capable of winning and have done so twice. I have chosen the consummate data thief Gabriel Santiago as my first runner. I like the criminal cards like Sneakdoor Beta and Inside Job which let you apply pressure to the Corp from the first round. As a Corp I went for NBN, which has great ability to tag the runner, but at the cost of a weaker economy than most Corps. Splashed with Scorched Earth of course. I also have lots of cards to advance, and some advancement tricks. For those of you interested, here they are. I have also posted these on Boardgame Geek, here and here. Thanks for the review, sounds cool. 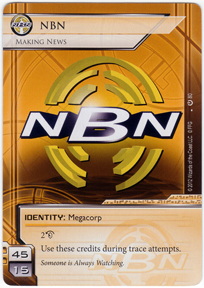 I think the all-in-the-box card game for something that used to be a CCG is an interesting idea, and probably works well for something like Netrunner where the two players work so differently.